Yay for Fridays! (Or late Thursday evenings well-spent with friends over cocktails!) The weekend is upon us and while no grand plan is in effect, I am still looking forward to it. And it all starts this afternoon with a little haircut. What are your plans for the weekend? Nina! That is so flattering! The girl in the picture is, after all, Mia Farrow. 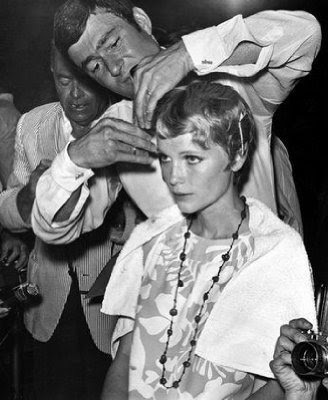 This was taken when she was having her hair shorn for "Rosemary's Baby"! gaaaah-short hair. maybe on my next visit to my hair lady, after 5-6yrs of thinking about it, ill cut it all off.